Its practically biblical out there! Though we had a spell of cold, rainy days, I think it is safe to say that the weather in Tokyo is hovering between winter and spring. If the local toad population could voice their opinion I am sure they would agree. But as the saying goes, action speaks louder than words. Giant toads are out in record numbers. Right here. Smack dab in the middle of the city. The other night I was about to pull into our garage but a mother and son were standing in the street, inadvertently blocking my path. A bit odd. As I neared the duo, I realized they were trying to coax a large toad to the curb. Good on them. 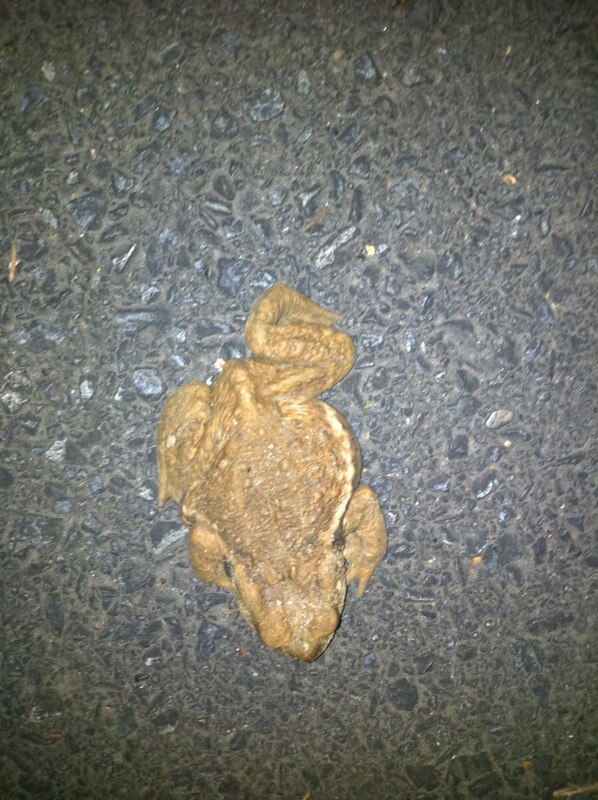 The following evening, Eve came home and reported that she and a friend spotted a toad at the edge of the street. Later, when we went out with Pippi, we stopped to investigate the scene but no toads in sight. Towards the end of our walk, that changed. First there was the toad near Step Park. This not-so-little guy (about the size of a baseball) was at the edge of the road, one leg extended and not budging, as you can see in the photo below. At first, we feared it was injured or worse. But I thought I detected a heart beat. We prodded gently with the edge of a shoe in the hopes that we could convince him or her to get out of danger but, of course, this one had to be the stubborn type. Or maybe it was scared and hoped we would just get off his/her horned back. So we crossed our fingers and continued on our way while marveling at not one, but two toads, in one day. When we entered the final stretch of our journey, we heard a distinct noise. It sounded like throaty chirping -- not quite dainty enough to be a bird but not quite husky enough for a toad. Or so I fleetingly thought. Within a few seconds we found the source: five, no make that six, toads cavorting in the puddles that dot an empty lot nearby. Hopping around and jumping on each others' backs, they looked, and sounded, as happy as can be. What is inspiring all these amphibious creatures to show their leathery, little faces right now? I think they are a few hops ahead of us lowly humans. My guess is that they portend the coming of spring. But I'm not sure where they are coming from. The remains of a small pond called Gameike are close but I have not actually seen this body of water (such as it is) so this is pure speculation. Yet, where there is one hidden water source, there might be others that are equally hospitable breeding grounds for these cheerful critters.